This is the first of a three part series I am going to put together on what golfers need to know about training their bodies to give them the potential to create more club head speed. The next two will be x-factor, and x-factor stretch. The aim is to keep it very simple, and provide some information and exercises you can put into use immediately. If you enjoy the content, I have created Fit For Golf Online Training Programs, designed to improve your golfing body. The advice in the articles and programs are a combination of my beliefs based on experience, and the scientific research I have studied. In pretty much every sporting movement that the athlete is standing, the ability to push force into the ground is extremely important. Think of a sprint, rugby tackle, punch, or tennis shot. All of these actions require high levels of force to be produced. In these actions even though it is the upper limbs eventually transmit the force into the opponent or racquet, the generation of power begins with the feet pushing into the ground. As the athlete pushes force into the ground, there is an equal and opposite force from the ground transferred back to the athlete (Newton’s 3rd law). The athlete then transfers this force through their legs, into the trunk, torso, arms, and finally hands. This is exactly how force is created in the golf swings of the vast majority of skilled/long ball strikers. The term kinematic sequence is often used to label this, which just means the order by which we transfer force through the different segments of the body. I have experienced clients significantly increase their club head speeds as a result of their training. 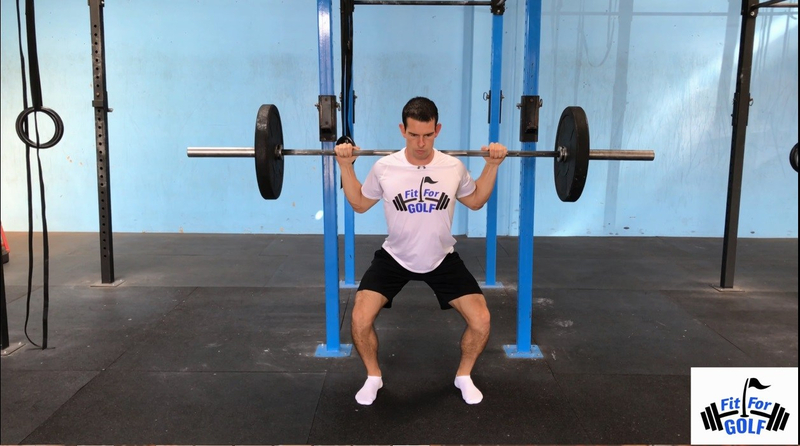 One of the reasons I believe this occurs is through a strong emphasis on developing the ability to push force into the ground through various types of jumping, squatting, deadlifting, lunging etc. As we know, if more force is pushed into the ground, there is a greater force transferred back into the body. More force transferred back into the body provides potential for more club head speed. I theorise that this increased force from the ground also gives the golfer a more stable base enabling them to rotate harder. Weak lower bodies, low levels of ground force, and unstable bases do not provide a good platform for powerful athletic motions. Our muscles are what enable us to perform movement and produce force. Stronger muscles = more force. The exercise below trains the ability to produce ground force, which hopefully you can transfer to your swing to produce more speed. I call this the “rear foot elevated split squat”. When you lower down to the bottom of the movement, you must push the foot into the ground (producing vertical force) to stand back up. Intent here is very important. Imagine you are trying to burst a hole in the ground with your foot. It is excellent for strengthening the quadricep and glute muscles. Try 3 sets of 5 reps each side, 3 times per week. As your strength increases, add weight. The information I provided in this short piece is just the tip of the iceberg in optimally preparing your body for golf. If you like what you read, you may be interested in availing of the Fit For Golf Online Training Programs which are being used by amateurs and pro’s across the world. Please feel free to share, tag, and ask any questions. Previous: Previous post: My 5 Pillars of Golf Strength and Conditioning. Hi – in your experience what is 1) a good goal and 2) an elite level goal for deadlift (hex / trap bar) strength for a golfer (relative to bodyweight)? Thanks. Hi Danny. Only seeing this now. 1.5 – 2.5 times bodyweight. Sorry for the delay, only seeing this now!